It was three years ago that the Souris (Mouse) River reached the highest level since at least 1881 in Minot. The levees were over topped on June 22 that damaged or destroyed 4,115 homes in Ward County (most of which were in Minot). The river crested on June 26 at 1,561.08 feet above sea level. At crest more than 26,000 cubic feet per second (cfs) of water was moving past the main gauge in Minot. A few years before that devastating flood in Minot, the thought that anywhere in central or western North Dakota would be experiencing historic floods in the near future would have been seen as unrealistic considering how dry that area was as seen with the Palmer Indexes in June 2008. Back in the summers from 2005 through 2008, moisture was in short supply, the rivers were barely running, Lake Sakakawea in 2005 was running at historic lows and rain was desperately needed. Much of the first decade of the 21st century, the western one-third of North Dakota experienced frequent dry spells, whereas, the eastern part of North Dakota and western Minnesota were generally experiencing very moist conditions. By the summer of 2009, enough rain had fallen in western North Dakota that the drought was over and the transition to over saturation was starting to become more evident in some parts of central North Dakota. This excessive moisture was from a combination of winter snow and abundant rainfall that occurred during the spring of 2009. Unknown at that time, but the Minot flood had its roots in 2009. But the main branches of the flood came in 2010 when the word drought seemed like a distant memory as the rains came turning the semi-arid high plains into a vast wetland. The rivers went from dry to flowing fast, the low areas were once again filled with water and the dry days were a memory. Instead, seeping basements, sump pumps running frequently became the norm in areas that were missed by the wetness that frequently plagued eastern North Dakota and western Minnesota since the early 1990s. The wet summer of 2010 was followed by a wet autumn, which was followed by a very snowy winter. Then another season of saturation occurred in the spring of 2011. 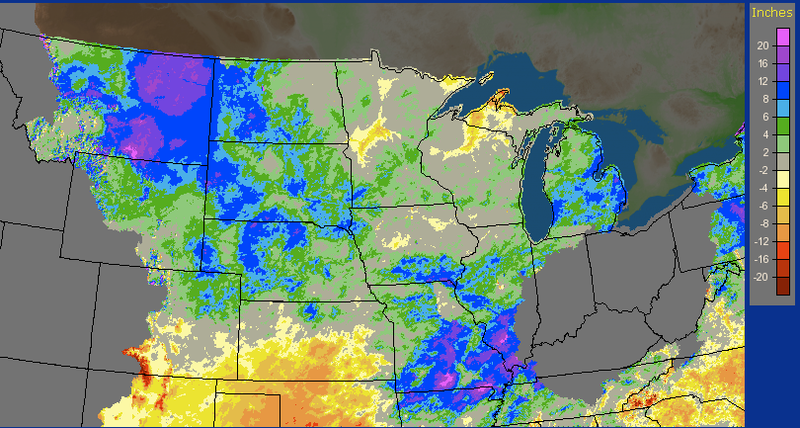 The spring of 2011 was the 7th consecutive season with above average precipitation for the state of North Dakota. In eastern Montana it was the wettest spring on record. The extremely wet winter in combination with one of the wettest springs since 1893 lead to a massive surge of moisture down the Missouri River. The Missouri River flooding, although certainly made worse by spring rains, was mostly caused by the tremendous snow that fell during the winter of 2010-2011. The abundant moisture in previous years in combination to the exceptionally wet 2009 and early 2010 caused Lake Sakakawea to rise 49 feet from 2005 through the beginning of the summer of 2011. That 49 foot rise would be enough water to cover the state of North Dakota to a depth of 4″ which is just one small example as to how much water that the northern plains recorded previous to the flooding in 2011. The excessive snow from the winter of 2010-2011 was not only a Rocky Mountain event, but it was also exceptionally snowy over much of the northern Great Plains. The prairie provinces of Canada also observed abundant snow fall that winter that was followed with well above average rainfall in April through June that year. The first 6 months of 2011 were likely the wettest on record in parts of southern Saskatchewan. Below is a graphic for the precipitation anomalies from average (rain and melted snow) that had fallen over the northern part of the United States from January through June 2011. Those parts of eastern Montana that received nearly 20″ of rain above normal does extend, from reports, into Saskatchewan, the source region of the Souris River that flows through Minot. That part of the United States and Canada only averages between 12″ and 18″ of rain per year and many areas received that much rain in the two months preceding the Minot Flood. Therefore, it should surprise no one that the entire northern tier of the high plains of the United States was completely saturated by the end of May 2011. Although this Palmer Index chart below is only for the United States, the prairie provinces of Canada would be listed as extremely moist as well. The excessive moisture found its way into all the river systems. In Minot, the Souris has been flowing high since early April, with the river at or above flood stage for most of the three months preceding the flooding that occurred during the latter half of June 2011. Although the Souris was running very high, it was manageable for the city of Minot until mid-June. In fact, after a mandatory evacuation of parts of the city, the residents were allowed back in and many thought the flood fight of 2011 was over, yet, only days later, parts of the city were evacuated again and then the battle was quickly lost as the river surged to record levels. Because of the distance from the Dopplers in the United States, the estimates above do not fully describe the areal extent of the heavy rain in Canada. This was the last straw that finally broke the proverbial “camel’s back”. With so much water flowing into the reservoirs that were already at capacity, the dam operators had no choice but to have outputs equal inputs. This cause the flows into the Souris River to increase from around 11,000 cubic feet per second to near 30,000 cubic feet per second rushing toward the city of Minot. This in turn raised the Souris to record breaking levels flooding hundreds of homes and businesses. Some floods happen in a day, but wide scaled flooding as what occurred along a huge stretch of the Missouri, the Souris and other river systems, usually have their roots in a long slow process. Hints to the devastation in Minot came nearly two years earlier with the rapid saturation of the soils and the corresponding high river flows for the years preceding the great flood of 2011.